There’s a very good reason why a strawberry banana smoothie is THE world’s number one smoothie. Apart from being absolutely delicious they are also easy to make. Bananas are a pantry staple. I always have some on hand. Moreover, strawberries are probably my favorite fruit. I love everything about them, from their juicy flesh, to their gorgeous red color. And it doesn’t matter whether you have the fresh variety or not. The frozen ones can easily be substituted. In fact, using frozen fruit makes your smoothie thicker and creamier. 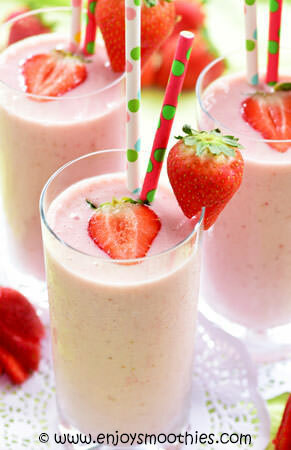 It’s almost impossible to create a bad strawberry banana smoothie which is important if you are a newbie. They are often the first ones we make when we venture into the smoothie world. 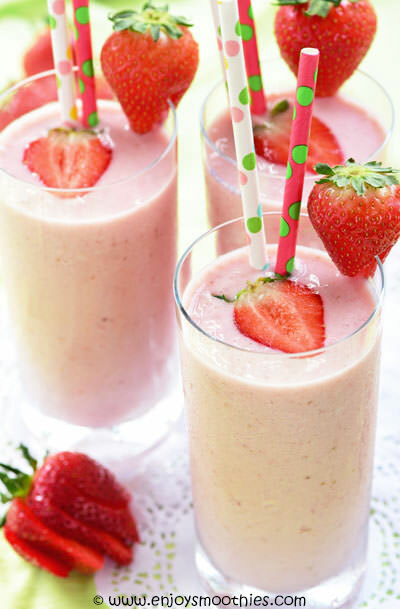 The combination of bananas and strawberries just seems to create awesome smoothies. But don’t stop there. Be adventurous and try different flavor combinations. Most fruits will blend in really well. Give your smoothie a tropical slant by adding tropical fruits and coconut. Add cacao for a chocolate strawberry milkshake, or add more berries for a berry delight. Begin with our basic recipe then start adding. Nutrition-wise each fruit on its own gives plenty of bang for your buck, but when you combine the two, you double the health benefits. Bananas are a great filler-upper, while providing essential nutrients such as magnesium, potassium, copper and vitamins A, C, K, thiamine, riboflavin, niacin and vitamin B6. While strawberries are packed with powerful antioxidants. They help lower the risk of cardiovascular disease, improve blood sugar regulation and help reduce inflammation. This is your basic recipe which makes a really creamy, delicious smoothie. To your blender add the banana, strawberries, yogurt, almond milk, honey and vanilla extract and blitz until smooth and creamy. Peel and chop the banana and hull and slice the strawberries. 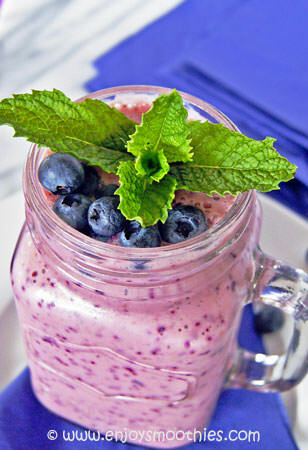 Place in the blender, together with the blueberries, vanilla yogurt and almond milk. Blend until smooth and creamy. Taste test your smoothie. If you crave a little more sweetness add the honey. 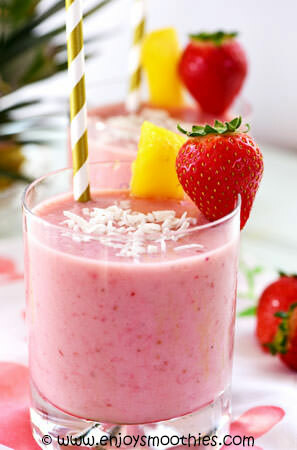 Add the frozen banana, pineapple pieces, strawberries and coconut milk to your blender. Whizz on high until smooth. Pour into two glasses and sprinkle over shredded coconut. 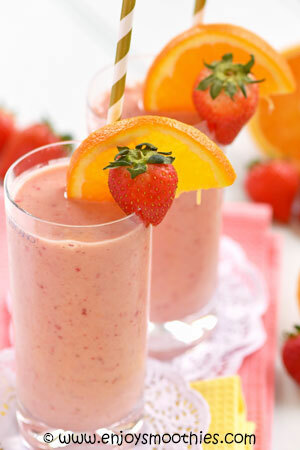 Blend together the banana, strawberries, orange segments, yogurt and almond milk until thick and creamy.